1. Amitabh Bachchan as the suppressed law-protector taking on the system - “Zanjeer”, “Khakee”, and more films than I can count. 2. Evil politicians not allowing super-cop to do his job to protect their own interests - again, “Khakee” and every film with Mr. Bachchan as a cop alongside every film with every lead actor trying to play cop. 3. Politicians instigating communal riots between Hindus and Muslims - “Bombay”, “Zakhm” and every movie about communal disharmony. 4. Misled youth opting for violence as an option to combat social oppression - Hrithik Roshan in “Fiza” and every movie with a lead actor playing a truant. 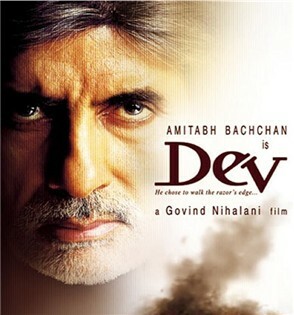 Dev has nothing new to offer other than the very interestingly crafted character of Joint Commissioner Tejinder Khosla played by the exceptional Mr.
Om Puri. Any actor of caliber would kill for an opportunity to play such a character, and Mr. Puri leads the way. However, Mr. Nihalani knows better than anyone else that a movie cannot possibly swim in rehashed themes and ideas, and still rely on the sole freshness of one character to see it through. It is indeed a pity then that this sensational director who personified originality with “Ardh Satya”, “Tamas”, and the classic “Droh Kaal” resorts to recycling. 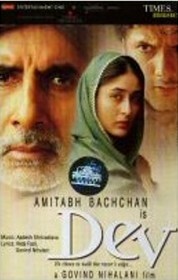 That the director can boast of strong performances is a given with Mr. Bachchan and Mr. Puri heading the cast. To give credit where it is due, kudos to Fardeen Khan and Kareena Kapoor for shedding their star personas and playing their characters with a taut sense of honesty. But whatever happened to imaginative storytelling? “Dev’s” social topicality, or rather lack of it, is another reason it fails to interest. One certainly cannot deny the parity that exists between Hindus and Muslims in Indian society. But after the numerous films that have beaten the issue black and blue, it simply does not make for engrossing viewing unless done with the freshness that Aparna Sen showed in “Mr. And Mrs. Iyer.” While Mr. Nihalani’s intentions may have been noble, his execution of the Hindu-Muslim conflict oscillates from being chilling, shocking, to downright offensive at times. While original content on its own can entertain more often than not, the craft of making a captivating film can often save rehashed themes (e.g. “Khakee”). Surprisingly, despite a director like Mr. Nihalani calling the shots, that craft in this recycled product too seems to be missing. Mr. Nihalani, it is time to shut the recycle bin and use the trash can. We don’t want to see what other filmmakers did; we want to see what you can do. And we all know there is a lot to where that comes from.